Friendsmily Steamboat House , Bandar Damai Perdana, Cheras . 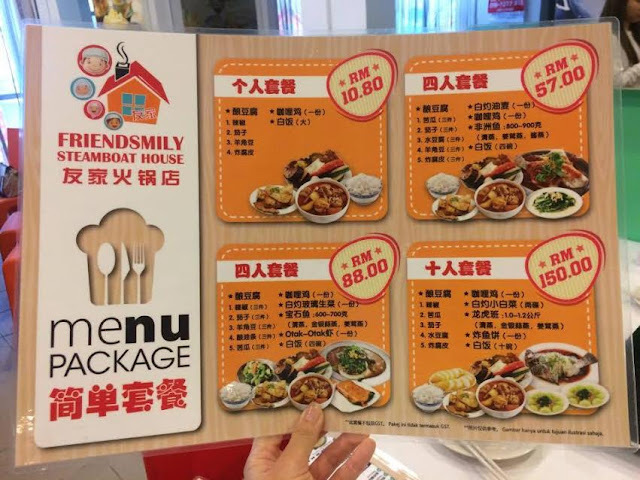 Friendsmily Steamboat House was started to operate on the 2nd November 2015 at Bandar Damai Perdana and the place is spacious with very simple interior of tables and colour chairs . At Friendsmily , they does it like self-service concept when all the foods keeps in chiller with steamboat ingredients such as fish balls , prawn balls , dumplings , wonton and many more . These were made in-house by their chef who has 10 year experience in the kitchen . 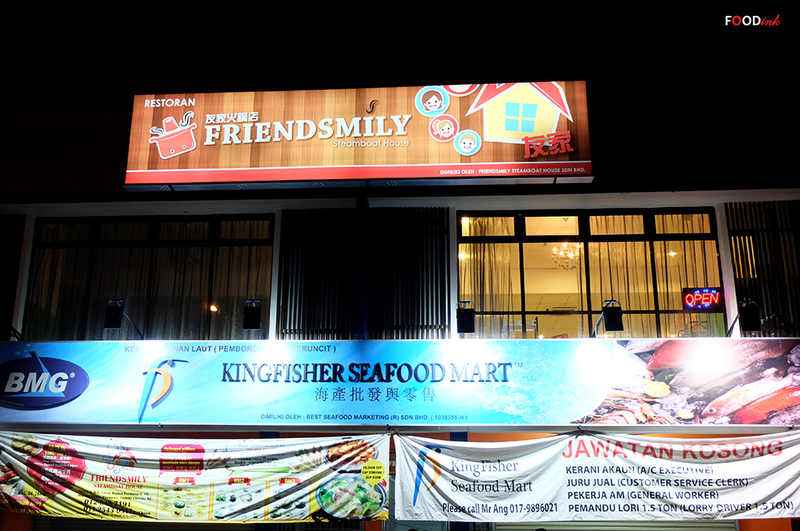 Kingfisher & Friendsmily makes you confuse ? Let me lead you , Kingfisher Seafood Mart was been in the wholesale and retail business for 20 years selling both fresh and frozen seafood . Over the years , they have received feedbacks from their customers that it is a hassle to prepare a meal and some were not too sure how to cook the seafood . With this in mind, they decided to diversify their business by collaborating with a restaurant in opening a pork-free steamboat house one floor above their seafood mart . 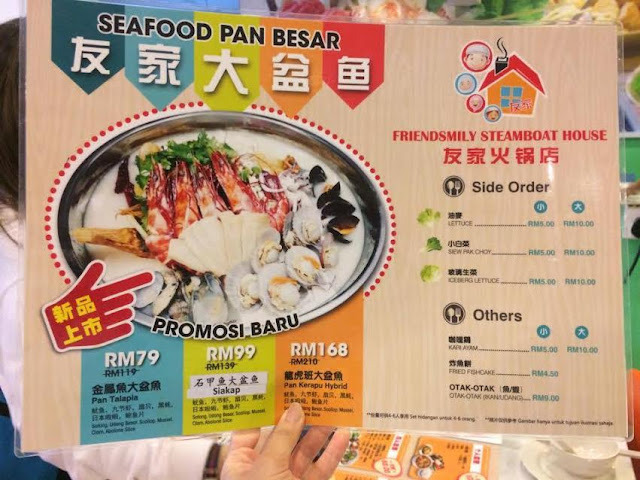 By doing so, the customers can enjoy a hassle-free steamboat meal and have a taste of their seafood at the same time at a low price . Above is the seafood options , walk down to the seafood mart downstairs and choose from the wide varieties such as live fishes , scallops , clams , unagi and many more . the ingredients will be sent to the kitchen and the chef will start preparing your food . The Wintermelon Pot is with cabbages , mushroom and goji berry , the soup become sweet while adding the fresh seafood and it was the famous pot at Friendsmily . If you love anything tomatoes, the savoury Sweet Corn Tomato Drumstick Pot would be a perfect choice for you . Friendsmily also offers Steamboat set for two person , you can see how fresh the ingredients are . We were told that a simple cooking method such as steaming is more than enough in bringing out the flavours of the fresh ingredients . Kapah , Scallops , Tiger Prawns , Abalone Slices , Fresh Prawn Ball , Sotong Ball , Fishball ,Teow Chew Fish Noodle , Wonton , Dumplings , Beancurd and many more . Set For Four person , Beside than steamboat their have variety of Chinese cuisine dishes to be order . like this set was perfect to be dine along with Steamed Jade Perch , Yong Tau Fu , Chicken Curry , Otak Otak , vegetable and four bowl of white rice . Friendsmily opens daily from 11.30am to 2.30pm for lunch and 6pm to 10.30pm for dinner. The restaurant closes every Wednesday , but will open for business if a public holiday falls on a Wednesday . 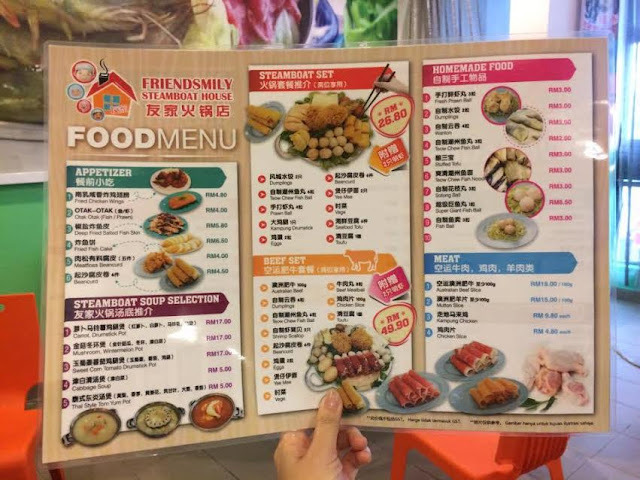 If you enjoy eating steamboat and love seafood, you would certainly have a good time at Friendsmily Steamboat House , especially with their low prices . I was so wish that their have a branch in damansara , I surely will visit them atleast once a week .